IRip and crosscut the stiles (A), top rail (B), and bottom rail (C) to the sizes shown in the Materials List and on Drawing 1. Dry-clamp the parts together, keeping the joints flush. Lay out the three dowel alignment marks at the top and two at the bottom on each side, where shown on Drawing 2. 2 Using a doweling jig, drill the lA" dowel holes 13/i6M deep. Gauge the depth carefully in the top rail. If you drill too deeply there, you* might cut into the holes when you cut the arch to shape in the following step. 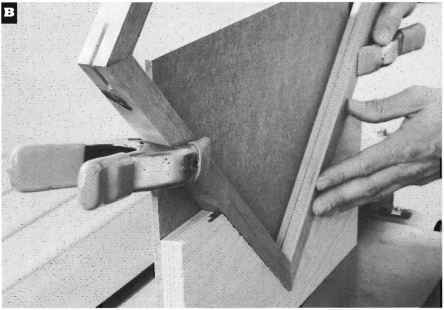 3Now, clamp the top rail (B) facedown on your bench to lay out the arch. Referring to Drawing 3, set a compass or a pair of trammel points to a 53/s" radius. The center will be off your work-piece, midway between the stiles and l3/i6M below the inside edge of the top rail. Draw the arc, and then bandsaw just to the waste side of the line. 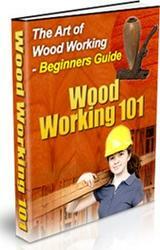 Sand to the line with a drum sander, or a sanding drum mounted in your drill press. Rout bottom front and sides with a large classical bit. Center(G)from side to side onto frame. ! Note: ^ _ ^ j Back of and© are j flush with back edge of ©. frame's diagonals. Equal measurements indicate a square frame. Make any necessary adjustments. After the glue dries, sand both sides. 5 Chuck a 3/i6M cove bit into your router. On the face side of the frame, rout around the inside of the arch. Then, rout the stopped coves along the inside edge of each stile and the bottom rail, where shown on Drawing 1. 6 Starting with stock planed to 5/s" thick, rip and crosscut the two filler pieces (D) to the dimensions shown. Glue one to the back of each stile, flush at the outside edge and both ends.